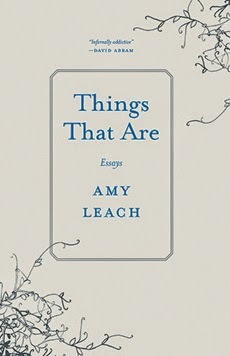 Amy Leach’s essay collection, Things That Are, invites readers to a change of heart and perspective by exploring topics from the natural world that tend to fall outside the human radar. In the first section, “Things of the Earth,” she employs her curiosity like a macro lens and a pair of binoculars, bringing the mysterious marvels of animals, plants, and insects into view. In one essay, she examines how tendrils on a pea plant reach blindly for a lattice. In others, she observes how a beaver hauls sticks to quiet the river, how fainting goats collapse at the sound of predators, and how a warbler beats its way across the ocean in a non-stop, ninety-hour flight. In the second section, “Things of Heaven,” Leach turns a telescopic lens on the vast and remote, exploring topics such as the identities of stars and the rules of orbit. Things That Are reminds readers that they live in a natural world of wonders fully accessible to those with the eyes and heart to see it. The azalea caterpillar, a black-and-white plaid caterpillar with a cherry-red head and legs, when disturbed, arches up its head and thrusts it back, like a hairpin, and arches its tail up like an S. To be honest, it looks more electrocuted than scary when it does this. The yellow-necked caterpillar twists itself into the same shape, except that the yellow-neck vibrates as well, which really brings electric trauma to mind. “To whom, then, does the Earth belong?” said the dragon as he was being slain. “Sometimes it seems to belong to dragons; at other times to dragon-gaggers. Sometimes it seems to belong to the harmattan wind, then to the doldrums. Sometimes to the slaves, when the sea parts to let them through, and sometimes to the sea when the sea does not part. Now to the siskin finch and sablefish; now to smitheries and smelteries. Perhaps the Earth is neutral, like a bridge between two cities, traveled on but possessed by no traveler.” Such are the behindhand ponderings of a doomed dragon.